It is difficult to identify lawn weeds without pictures. In fact, sometimes you need to see several photos, at different stages of growth, to find one that matches. Where do you find a source that has compete sets of pictures of lawn weeds? Putting together good quality pictures that will be useful in identifying weeds is an enormous undertaking. There have been many attempts to provide this on various web sites. Many of them are deficient, either because of the quality of the photos, or because of lack of information about the weeds to help with your evaluation. Others may not be helpful to you if they don’t deal with the common weeds in your geographic area. "Oh, yeah, I thought so... are you sure it's not clover?" Horseweed? Rather than trying to produce a new photo gallery to help identify lawn weeds, I’m going to give you evaluations of the best existing resources and a direct link to them. The included web sites have taken different approaches to the problem of identifying lawn weeds. I’ll give a short summary of each site to assist you in choosing a site to visit. Many of the sites are educational institutions with a broad appeal to a large area. Some of them are private ventures. One of them even gives a “weed alert”, so you know when to be on the lookout for certain troublesome weeds! Early treatment is the key to weed control. Click on the resource name to go to each site. The information will open up in a new window so you will not lose your place -- it just covers this page. Once you have been able to identify lawn weeds that are showing up in your grass, take a look at some of the Garden Counselor articles listed on the bottom of the page. They offer in-depth discussion about controlling weeds, guiding you through the best things to do, and informing you of the things to avoid. University of Illinois, Midwestern Turfgrass Weed Prevention and Control. Provides pictures to identify lawn weeds, broadleaf and grasses. Each selection has 6 photos that can be enlarged so it is easy to identify lawn weeds at any stage. Michigan State University - Turf Weeds. Identify lawn weeds easily and accurately with this extensive lawn weed identification key. Excellent pictures of many life stages of the weed (see thumbnails that enlarge). Sorted by family, grassy or broadleaf, or by common name alphabetically. 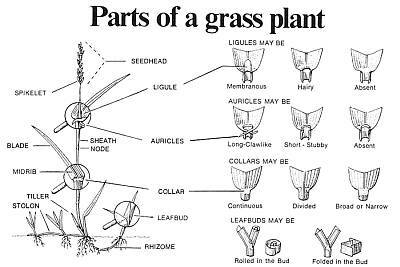 Also provides important keys to identifying lawn weeds by listing other names it is known by, special points to look for, and look alikes that can confuse. Designed for the Midwest USA, but the broad list will be helpful for many other areas as well. Editor's note 04/09: A new search I.D. tool has been added that is excellent. You select images that match characteristics like leaf shape, leaf edges, leaf arrangement or flower color. University of California, Davis, Integrated Pest Management. Offers a Weed Identification Photo Gallery, listed alphabetically. Very good photos, most varieties have 2 - 4 pictures. Information is short, helpful, sometimes a bit technical. An alternate way to identify lawn weeds is to search using the button at the top of the Index: “Key To Weeds In Turf”. Follow this for a guided tour that offers drawings of plant parts. You keep choosing different options until you get a selection of the most probable lawn weed it identifies. The pages load quickly some times, other times very slow. It may be a busy site, especially on weekends. Rutgers, State Univ. of New Jersey, Agricultural Experiment Station. This link goes directly to a page of thumbnail photos which are excellent for comparison if you don’t know where to start looking. Other sites that just list a bunch of names may overwhelm you. These small pictures of weeds give you a head start. The photos enlarge and are good quality. The information is interesting but doesn’t offer much help to identify lawn weeds. Thumbnail photos alphabetically listed, separated into 4 major regions in the USA: Western, Southern, North Central, North East. Weed alerts posted according to your geographical area. Germination dates by weed variety for your specific zone in the USA. Cultural control and herbicide use for various weeds at different times. Note: the suggestions for herbicides to kill weeds are intended for professional applicators. Many are not available for homeowners. Virginia Tech Weed Identification Guide. Extensive photos of most weeds in various stages of growth will assist you as you try to identify lawn weeds --- IF you know what you’re looking for. The index is alphabetical, and there are too many choices to search one by one. Use this site when you have the name of a weed and need better photos or alternate age pictures of weeds. Also has a system for identifying grassy weeds by answering questions about the appearance. Before you investigate further, see if these diagrams will assist you in understanding the descriptions provided in some resource sites. 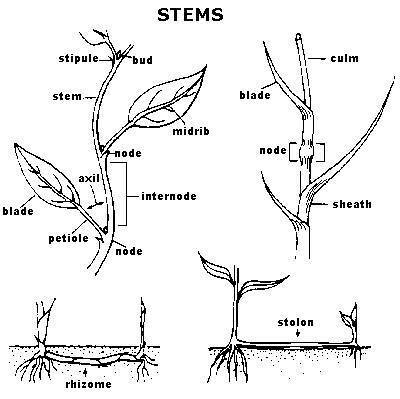 This basic terminology is used to differentiate between various specimens when identifying weeds. Image courtesy of Wisconsin Dept. of Natural Resources. See more sketches at their invasive plants page. Image courtesy of the University of Georgia College of Agricultural and Environmental Sciences. See another illustration and descriptions at this Georgia Turf page. University of Washington, Cooperative Extension (Hortsense). Provides a long list of common weeds. The photos are not always adequate and may not be the stage of growth you need to see. The descriptions are rather technical. But it is helpful to know what is typical for the Northwest USA for people needing to identify lawn weeds in that area. University of Illinois. Weed Science. Geared more to agricultural settings than lawn weeds, but has excellent photos. The index is divided by how the leaves are situated, which may help as a starting point for identifying lawn weeds. University of Georgia. An acceptable resource for the Southern States. Photos of lawn weeds are adequate. Very extensive list of both broadleaf and grassy weeds that can be accessed by list of names or thumbnail photos that will enlarge and have an additional view. Minimal descriptions. Mississippi State Extension. Weeds of lawns, yards and flower beds. Categories of broadleaf, grassy and vining weeds, summer and winter varieties. Good pictures but not always the most helpful view. Site is under construction, so it should improve, but it will assist anyone living in the Mississippi region. Weeds In The UK. Identifies 50 common garden weeds in the UK, with brief description, photos of seedling stage and flower stage only. Categories are divided by colors of flowers. May be useful when you have weeds at the mature stage. Utah State University Extension - The Weed Web Photo Library. This layout is a nuisance to use, but the photos are excellent. No descriptions. The photos are accessed first alphabetically, then you select from a chart that offers plant, flower, seed, leaf and young plant. Not all weeds have all pictures, but it is still a helpful look with quality pictures for weed identification. Canada Weed Tools Guide by Syngenta. (NOTE: GUIDE IS NOT OFFERED ON SITE NOW -- MAYBE IT WILL RETURN???) Tutorial guide asks you to select various leaf styles and other factors, then provides a likely weed choice. Has separate categories for broadleaf or grassy weeds or sedges. Provides detailed description by life-cycle, seedling, stem, roots, leaves, flowers. Also an alphabetical listing if you know weed names. Most photos are good quality and helpful for identifying weeds, but not just lawn weeds. Weed Science Society of America. This photo gallery contains pictures of many plants that are common to North America. Some of the plant species listed are not generally considered weeds but may have toxic or poisonous properties, or are otherwise of general interest as wildflowers or herbs. Identifying lawn weeds on this site will be tedious unless you already know the names of suspected weeds. But the photos are worth checking out. Illinois Council on Food and Agriculture Research. Suited for very technical approach to weed identification, with very exact search parameters. Lists 172 varieties, so it is not just lawn weeds. If you are looking for a weed by name and can’t find it elsewhere, this site may help. University of Florida Extension, Frequently Asked Questions On Weeds. An interesting list of questions to help identify lawn weeds in Florida. The answers are very informative. The thumbnail photos are worthless. But if you have encountered the same problems as these writers, you may find the comments helpful. The ability to identify lawn weeds is important, because the method of control and the timing can be critical. If any of these links change and no longer serve this function, please contact me so I can correct or remove it, and save others any bother. Were these resources helpful to you? Please share this page with others who need assistance in trying to identify lawn weeds. You can copy the following page URL and paste it in an e-mail for sending to others or include the URL in articles you may write. ENDORSEMENT: Once you have identified the pesky weeds infiltrating your yard, what will get rid of them? I acquire many of the products I use from "Do My Own Pest Control." You will find they offer one of the largest selections, and their detailed customer reviews can help you connect your situation with the best possibility. They have great customer service, and free shipping is the clincher! Go to General information on lawn weeds. Go to Using Weed Killer. Go to Learn About Homemade Weed Killer.